This morning I came across two old articles from a Seventh-day Adventists publication: Is There a Relationship Between Luther and Seventh-day Adventists? (1955). I expected a poorly documented bit of propaganda. The first article was more along the lines of propaganda, but I was rather surprised to find that the second article was more balanced. The important factors covered in the second article were items particular to Seventh-day Adventistism: the Sabbath, eschatology, the state of the dead, and the Antichrist. On the Sabbath, the article concludes Luther was right that the Sabbath is to be kept holy, but wrong on the day of the week it is to be observed. On eschatology, the article rightly argues Luther was convinced he lived in the end times, and that the Antichrist could be found in the papacy and in Islam. As on many other teachings, Martin Luther expressed contradictory opinions on the state of the dead. We can find in his sermons the main opinions as they were current in his time. In his works he refers 125 times to death as being a sleep; but in 32 other passages he states on the contrary that death is a conscious state; 7 times he says that the dead live but are unconscious; and elsewhere he writes that the dead are sometimes conscious and sometimes unconscious. [See all references in Toivo Nikolai Ketola, A Study of Martin Luther's Teaching Concerning the State of the Dead (M.A. thesis, S.D.A. Theological Seminary, 1946), pp. 27-3]. The author cites a then unpublished study that I've certainly never heard of, and I would be curious to know which writings (and in which language) were surveyed. Whether or not the statistics are correct, there were indeed times in which Luther advocated the idea that after death the soul ‘sleeps’ until the final resurrection. The soul hibernates until the resurrection- when it is then awakened and reunited with its body. Luther stated this at times in somewhat undogmatic terms, cautioning his readers that we don’t have full understanding of this subject. At times he says things that contradict ‘soul sleep’- his was not a dogmatic conclusion. Luther knew that describing the state of the dead was speculative theology. The state of the dead was prone to wild speculation during his time. He would not join in to such folly. For more information, see my earlier blog entry here. Compare and contrast articles as these put together by the Adventists can be tricky things. Certainly any group claiming the Bible as an authority can find areas of agreement and disagreement with other groups claiming the Bible as an authority. This doesn't mean though that Luther and the Adventists are on the same page, and would enjoy fellowship with each other. Consider the fact that at the Marburg colloquy in 1529, Luther and Zwingli agreed on 14 out 15 articles of doctrine, yet the one article they disagreed on was for Luther, a deal breaker. Luther would most-likely have problems with many aspects vital of Adventist doctrine, most particularly the role of Mrs. White and the place of the law. Which Roman Apologist Interprets the Pope Correctly? Am I the only one who finds great irony in the various interpretations of what the recent pope has been saying? I visit various Roman Catholic websites, and I find such stuff like this. Then I visit another Roman website, and find stuff like this. Some people are claiming that various "spins" are being put on the papal statements. Why is the pope so unclear? Perhaps this is the answer? For a guy who's supposed to have the ability to speak infallibly, he certainly has a lack of clarity when not speaking infallibly. We appear to be left in the hands of Roman laymen, all claiming the ability to interpret the pope correctly. Yes, we're left with the private interpretations of Roman Catholic laymen. I hope this pope has a long career. What did Luther mean by, "They are teaching me to be rude"? Toward the end of Luther's life, his poor physical health was said to have made him short-tempered and even harsher in his writings and comments. His wife Katharina was overheard saying, "Dear husband, you are too rude," to which he is said to have responded, "They are teaching me to be rude." What did Luther mean by this? I am particularly interested in who Luther thought the "they" was... Did Luther believe he was under some sort of spiritual attack? Possibly somewhat like Paul's "thorn in the flesh"? However, according to Paul this was done to keep himself from being proud, not to make him rude. His poor physical health made him short-tempered and even harsher in his writings and comments. His wife Katharina was overheard saying, "Dear husband, you are too rude," and he responded, "They are teaching me to be rude." Wikipedia actually documents the quote: Spitz, Lewis W. The Renaissance and Reformation Movements, (St. Louis: Concordia Publishing House, 1987), p. 354. There Spitz states of Luther's final days, "Sick and constantly apprehensive about the danger of war, he became short-tempered and even harsh, though in behalf of the cause and not from personal peevishness. In response to Kathie's chiding, 'Dear husband, you are too rude,' he retorted, 'They teach me to be rude!'" Spitz provides no documentation. Schwenkfeld sent the doctor his book on the humanity of Christ, entitled Dominion. 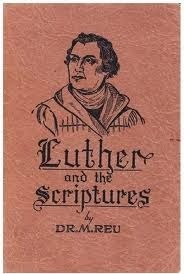 Luther said : " He is a poor man, without genius or talents, smitten like all the ranters. He knows not of what he babbles, but his meaning and sense is : l Creatures are not to be adored, as it is written : " Thou shalt worship the Lord thy God and him only shalt thou serve." ' Then he argues : * Christ is created, therefore we should not pray to the man Christ.' He makes two Christs. He says the created Christ, after his resurrection and glorification, was transformed into a deity and is therefore to be adored, and he foully cheats the people with the lordly name of Christ, saying all the while that it is for Christ's glory ! Children go to the heart of the doctrine with : 'I believe in Jesus Christ our Lord, conceived of the Holy Ghost, etc.,' but this fool will make two Christs, one who hung on the cross and the other who ascended into heaven, and says I must not pray to the Christ who hung on the cross and walked on earth. But he let himself be adored when one fell down before him, and he says : ' Whoso believeth in me, believeth in him who sent me.' This maniac has stolen some words out of my book." . . .
Katie said : "Dear husband, you are too rude." Luther answered: " They teach me to be rude." ... To the messenger he answered: " My dear messenger ! Tell your master Schwenkt'eld that I have received his letter and pamphlet. And would to God he would stop! Formerly he kindled a fire in Silesia which is not yet quenched and which will burn him eternally. And he adds to that the heresy of Eutychianism on the creation of Christ, and makes the Church err, as God has not commanded him to do. The senseless fool, possessed of the devil, understands nothing and knows not whereof he babbles. But if he will not cease writing, at least let him leave me in peace, untroubled by the books of which the devil has purged him, and let him take this as my last judgment and answer : The Lord rebuke thee, Satan, and may the spirit which called you, and the race you run, and all your fellow sacramentarians and Eutychians, go with you and/your blasphemies to perdition." . . . Source: Preserved Smith, The Life and Letters of Martin Luther, pp. 406-407. Unfortunately, Smith provides no documentation either. Follow-up: The 38 Most Ridiculous Things Martin Luther Ever Wrote? Previously I mentioned a blog entry entitled, The 38 Most Ridiculous Things Martin Luther Ever Wrote. The material presented was a blatant cut-and-paste from Luther, Exposing the Myth. Of the "38 most ridiculous things," only two quotes were not taken from Luther, Exposing the Myth. After a few cursory searches, it's highly probable these two other quotes were taken from another Roman apologist's website (the quotes and documentation are presented in the same form, with the same typo, and the same historical error). The two quotes have to do with "Martin Luther on Capital Punishment and Charity." The author of "the 38 most ridiculous things" appears to have little or no understanding of the 16th Century mindset in regard to religious toleration, and presumes that "charity" was the Roman standard during this period (it was not! ), and implies Luther fell far from it. The first quote (#17) turns out to be authentic, while the second quote (#18) turns out to be something written by Melanchthon, not Luther. Here are the quotes utilized, and a brief evaluation. A question arises in connection with these three verses [Psalm 82]. Since the gods, or rulers, beside their other virtues, are to advance God’s Word and its preachers, are they also to put down opposing doctrines or heresies, since no one can be forced to believe? The answer to this question is as follows: First, some heretics are seditious and teach openly that no rulers are to be tolerated; that no Christian may occupy a position of rulership; that no one ought to have property of his own but should run away from wife and child and leave house and home; or that all property shall be held in common.﻿﻿ These teachers are immediately, and without doubt, to be punished by the rulers, as men who are resisting temporal law and government (Rom. 13:1, 2). They are not heretics only but rebels, who are attacking the rulers and their government, just as a thief attacks another’s goods, a murderer another’s body, an adulterer another’s wife; and this is not to be tolerated. Second. If some were to teach doctrines contradicting an article of faith clearly grounded in Scripture and believed throughout the world by all Christendom, such as the articles we teach children in the Creed—for example, if anyone were to teach that Christ is not God, but a mere man and like other prophets, as the Turks and the Anabaptists hold—such teachers should not be tolerated, but punished as blasphemers. For they are not mere heretics but open blasphemers; and rulers are in duty bound to punish blasphemers as they punish those who curse, swear, revile, abuse, defame, and slander. With their blasphemy such teachers defame the name of God and rob their neighbor of his honor in the eyes of the world. In like manner, the rulers should also punish—or certainly not tolerate—those who teach that Christ did not die for our sins, but that everyone shall make his own satisfaction for them. For that, too, is blasphemy against the Gospel and against the article we pray in the Creed: “I believe in the forgiveness of sins” and “in Jesus Christ, dead and risen.” Those should be treated in the same way who teach that the resurrection of the dead and the life everlasting are nothing, that there is no hell, and like things, as did the Sadducees and the Epicureans, of whom many are now arising among the great wiseacres. By this procedure no one is compelled to believe, for he can still believe what he will; but he is forbidden to teach and to blaspheme. For by so doing he would take from God and the Christians their doctrine and word, and he would do them this injury under their own protection and by means of the things all have in common. Let him go to some place where there are no Christians. For, as I have often said: He who makes a living from the citizens ought to keep the law of the city, and not defame and revile it; or else he ought to get out. We are told that when the holy fathers at the Council of Nicea heard the doctrine of the Arians read, all hissed unanimously, and would not listen or permit any argument or defense but condemned them out of hand, without disputation, as blasphemers.﻿﻿ Moses in his Law commands that such blasphemers and indeed all false teachers should be stoned (Lev. 24:16). So, in this case, there ought not to be much disputing; but such open blasphemers should be condemned without a hearing and without defense, as Paul commands (Titus 3:10):﻿﻿ “A heretic is to be avoided and let go, after he has been admonished once or twice”; and he forbids Timothy to wrangle and dispute, since this has no effect, except to pervert those who hear (1 Tim. 6:20). For these common articles of all Christendom have had hearing enough. They have been proved and decreed by the Scriptures and by the confession of the whole church, confirmed by many miracles, and sealed by the blood of many holy martyrs. They are testified to and defended in the books of all the doctors. They need no more discussion and clever interpretation. Janssen documents the quote as "the [injunction] of 1536 (published in the Zeitschr für histor. theol. xxviii , p. 560 ff." This refers to Zeitschrift für die historische Theologie, Volume 28. Page 560 can be found here. What's being referred to is a document drawn up by Melanchthon entitled, Ob christliche fürsten schsind, der Wiedertäufer unchristliche Sect mit leiblicher Strafe und mit dem Schwert zu wehren, or, Das Weltiche Oberkeitt den Widertafferen mit leiblicher, Straff zu weren schuldig sey / Etlicher Bedenken zu Wittenberg, which can be found in WA 50: 6-15. The error of attributing this writing to Luther is throughout the Internet. Whoever originally swiped this quote from Janssen (and I'm fairly certain I know who that was) never bothered to look the quote up to check it. Hence there are now all sorts of web pages claiming Luther wrote it. Shame on Rome's apologists, once again. What can be said of it is that Luther and the other Wittenberg theologians signed the document in agreement with what Melanchthon had penned. For an overview of this document, see: John S. Oyer, Lutheran Reformers Against Anabaptists, p. 173 ff. I've yet to find a complete English translation of this short document. But suffice it to say it clearly does not qualify as something Luther wrote. It's time for Rome's defenders to once again, delete and revise their historical blunders. Those of you familiar with basic Reformation history should know the name of Roman Catholic theologian and apologist, Johann Eck. Johann Eck's 404 Theses, 1530 is an interesting look at how he understood the beliefs of the Reformers. Eck was perhaps the top Roman apologist of his day. Here is a brief summary as to how Eck understood the Mariology of the Reformers. I present this because there are Roman apologists today that argue "the Reformers accepted almost every major Marian doctrine and considered these doctrines to be both scriptural and fundamental to the historic Christian Faith." Sometimes they'll go as far as saying the Mariology of the Reformers has been "covered up." Note below, Eck was certain the Reformers had a quite a different "Mariology" than what was the norm during the 16th Century. 91] Christ said to Mary: "What have I to do with thee!" meaning: Because you are a woman you think that some special favor will be shown you by me on the ground of a merit of prerogative. Understand, however, that you have no more influence with me than the woman who was a sinner, or the Syrophenician (Melanchthon) . The 38 Most Ridiculous Things Martin Luther Ever Wrote? Over on the Catholic Answers forums I came across a person advertising his blog entry, 500 Years of Protestantism: The 38 Most Ridiculous Things Martin Luther Ever Wrote. What really shocked me was the attitude of the person who posted this recent blog entry. He appears to want to be taken seriously as some sort of Roman apologist. He actively promotes himself by writing books, has some sort of (internet) radio show, Youtube videos, and "media appearances," and of course he accepts donations. In terms of marketing, he has put a lot of time and care into his image, more than most of the self-proclaimed Roman e-pologists around today. But the polished appearance is backed up with little apologetic substance. With the exception of two quotes, the majority of "the 38 ridiculous things" were direct cut-and-pastes from the web page, Luther, Exposing the Myth. (Luther, Exposing the Myth appears to have been partially plagiarized from: Verbum the newsletter of St. Thomas Aquinas Seminary in Ridgefield, CT, Spring 1985). Context and translation aside, let us not miss the central point - Luther was a teacher of hate, violence, intolerance, and polygamy. He also modified Scripture and rejected the Divine Revelation of some books in the Bible. So... you don't care if the quotes you posted are accurate or not? How is it you consider yourself an "author" that has written a book on apologetics, and history isn't important to you? The goal of going through particular quotes is not to defend Luther as a Protestant saint. I see the study of any person in church history as an exercise in the love of God and neighbor. How do I love my neighbor in the study of church history? There probably are many ways, but the one that applies here is in my words. If I bear false witness against my neighbor, even if he's been dead for hundreds of years, I am not loving him. I say let the people in church history be exactly who they were, warts and all. Luther certainly had warts and sins, but he did not "kick the cat" as well on the way to posting the 95 Theses. That is, he is not as bad as many portray him to be. Why would you want to bear false witness? Zeal without truth= nothing. James Swan we aren't going to keep going back and forth about this. You are a Protestant and an apologist for Luther. That's your perspective. I read your critiques. Some of them I agree with, some I don't. You don't have to agree with the ones I selected to make an example of. That's your free choice. There is no false witness here, inasmuch as there are keen and respectable differences in translation, understanding, and motive to interpret (re-interpret) both. Again, the overall motive of this article is to demonstrate a few things that I'm sure you don't disagree with - that: 1. Luther taught hate. 2. Luther taught violence. 3. Luther taught polygamy. 4. Luther hadn't a clue what the Catholic Church actually taught (to no fault of his own in a sense). 5. Luther was invested in championing the German Princes interest and that greatly affected his theology. 6. Luther did not come in the mold of a true prophet of God. Prophets were an the ascension of holiness, rather than on the descent into debauchery and earthly interest. I am absolutely certain you have no desire "to keep going back and forth about this," because frankly, you don't appear to want to do the hard work that truth demands. Ah well, it's the Internet. Responsibility isn't always a top priority. In one other comment, he stated, "James Swan I read your article. I complemented you on it, but I disagree with some of your opinions." So even though I can demonstrate the very first quote he posted is bogus, that just "my opinion"? Wow. Amazing. It was obvious the man did not want to have any interaction with me, or perhaps couldn't. I think in all the years I which I've challenged Romanists on their materials, never have I come across someone so allergic to truth while so intent on promoting himself as an apologist. Decet Romanum Pontificem, Leo X, third section: Our decrees which follow are passed against Martin and others who follow him in the obstinacy of his depraved and damnable purpose, as also against those who defend and protect him with a military bodyguard, and do not fear to support him with their own resources or in any other way, and have and do presume to offer and afford help, counsel and favour toward him. All their names, surnames and rank—however lofty and dazzling their dignity may be—we wish to be taken as included in these decrees with the same effect as if they were individually listed and could be so listed in their publication, which must be furthered with an energy to match their contents. Then from the end of the bull: No one whatsoever may infringe this our written decision, declaration, precept, injunction, assignation, will, decree; or rashly contravene it. Should anyone dare to attempt such a thing, let him know that he will incur the wrath of Almighty God and of the blessed Apostles Peter and Paul. Christ used hyperbole often, for example when he declared, "If your right eye causes you to sin, pluck it out and throw it away; it is better that you lose one of your members than that your whole body be thrown into hell" (Matt. 5:29, cf. 18:9; Mark 9:47). Christ certainly did not intend this to be applied literally, for otherwise all Christians would be blind amputees! (cf. 1 John 1:8; 1 Tim. 1:15). We are all subject to "the lust of the flesh and the lust of the eyes and the pride of life" (1 John 2:16). Tim Staples says it isn't hyperbole. Listen here.Tim says if your eye or hand offend, cut the eye out and cut the hand off.. "because I'm gonna get a new one when I get to heaven..."
37. Calvin Memorial Addresses, p. 112. As typical of a book from Boettner, the reference is vague. In this instance though, through the help of Google, "Calvin Memorial Address" by Dr. R.A. Webb is available: Calvin's doctrine of Infant Salvation. Dr. Webb points out that the information on Calvin's view is controversial, in that various extracts from his writings are marshaled together to indict him of teaching certain infants dying in infancy are damned. He goes through a number of these quotes. Webb argues as Boettner summarized above. Webb's form of argument appears to me to be similar to those who argue Calvin held to a limited atonement. That is, without direct and lengthy statements from Calvin on a particular issue, his position is arrived at by evaluating controversial or vague quotes, and then plugging them into his system. What interested me about Webb is that if he's correct, Calvin in essence taught a form of the age of accountability. While I can think of a few specific Reformed theologians that held (or hold) a type of "age of accountability," I'm not familiar with any major Reformed confession teaching it. The popular notion of an "age of accountability" is more of an Arminian concept- that children reach a particular age in which they are culpable for their sins. That is, if they haven't accepted Jesus Christ (or even heard of him) before this particular age, and if they die before that particular age, they go to heaven. I've often wondered why Arminian parents would ever want to take the chance of allowing their child to reach the age of accountability and risk having that child potentially lost for eternity. I've recently come across a number of Lutheran-related discussions on baptism. More often than not, the majority of non-Lutherans in these exchanges have little understanding of the Lutheran position, and to make matters worse, very few Lutherans in these discussions appear to actually have the ability to explain their view succinctly and cogently to those who oppose it. This makes for a heated discussion with little or no substance or progress from either side. I don't claim to have any sort of expert knowledge on the various strands of Lutheranism, but it should be possible to read the historical record of what Martin Luther said on baptism and outline his view. To understand an historical position does not imply that one must agree with that position. However, if one wants to respond effectively, one must first demonstrate an understanding of that which one opposes. I offer the following to my non-Lutheran friends in an effort to help clarify at least Luther's view. Whether or not the particular Lutheran you're interacting with holds this view or not is up to you to determine. As you read each of the points below, ask yourself if you to agree or disagree with Luther's view. I've also added some related questions to consider. In other words, as the explanation moves along, try and pinpoint where you actually have the disagreement with Luther's view. For my Lutheran friends, I would indeed welcome any comments or clarifications on Luther's view of baptism. If I've taken Luther out of context or missed something substantial in his theology, I would appreciate any corrections or clarifications. One of the first keys to unlocking Luther's view is that for Luther, baptism is a form of God's Word. Therefore, to reject the crucial importance of baptism or think of it as a human "work" is to reject God's Word and God's work. Just like when one reads the pages of Scripture and hears the very voice of God promising that if one trusts in Christ alone and Christ's work that person will be saved, so to in baptism, God promises that baptism "effects forgiveness of sins, delivers from death and the devil, and grants eternal salvation to all who believe, as the word and promise of God declare" (BC, 348). Question: Do you think that baptism is a form of God's Word? Is this sacrament another way in which God communicates? Is minimizing the significance and importance of baptism akin to taking God's Word for granted? In one of Luther's early writings (1520), The Babylonian Captivity of the Church, Luther argued the sacraments collectively were divine promises (God's Word) attached to outward signs (Baptism, the Lord's Supper, etc.). The promise is that God will forgive sins. It isn't the water of baptism that forgives sins, it's the Word of God connected with the water (BC 349). Question: Can God's Word be "attached" to a sign? Is there Biblical precedent establishing this basic principle? Is it similar to the Old Testament temple and such things like the Ark of the Covenant and the slabs in which God wrote the Ten Commandments? The basic structure of Luther's theology of baptism is a triad of divine promise, sign, along with a third thing: faith. An atheist can read God's promise to forgive his sins, but does this mean such a person merely reading the words has salvation? In the same way, if one were to force a group of atheists into a Lutheran church to be baptized, does this mean that such a group has been saved by such a baptism? Of course not. "Therefore let us open our eyes and learn to pay heed more to the word than to the sign, more to faith than to the work or use of the sign. We know that wherever there is a divine promise, there faith is required, and that these two are so necessary to each other that neither can be effective apart from the other. For it is not possible to believe unless there is a promise, and the promise is not established unless it is believed. But where these two meet, they give a real and most certain efficacy to the sacraments. Hence, to seek the efficacy of the sacrament apart from the promise and apart from the faith is to labor in vain and to find condemnation. Thus Christ says: “He who believes and is baptized will be saved; but he who does not believe will be condemned” [Mark 16:16]. He shows us in this word that faith is such a necessary part of the sacrament that it can save even without the sacrament, and for this reason he did not add: “He who does not believe, and is not baptized.” [LW 36:67]. Question: According to this quote from Luther, can the administration of Baptism on a person without faith ultimately save that person? According to this quote from Luther, can a person be saved without being baptized? The question then arises that if baptism only has effect when faith grasps the promise of grace in the sign, why should infants be baptized? Why baptize an infant that can't demonstrate a fides viva (living faith)? Luther's position on baptism developed on this issue but did not contradict itself. Therefore we here conclude and declare that in baptism the children themselves believe and have their own faith, which God effects in them through the sponsors, when in the faith of the Christian church they intercede for them and bring them to baptism. And this is what we call the power of alien faith: not that anybody can be saved by it, but that through it as an intercession and aid he can obtain from God himself his own faith, by which he is saved. It may be compared to my natural life and death. If I am to live, I myself must be born, and nobody can be born for me to enable me to live; but mother and midwife can by their life aid me in birth and enable me to live. In the same way I myself must suffer death, if I am to die; but one can help to bring about my death, if be frightens me, or falls upon me, or chokes,crushes or suffocates me. In like manner, nobody can go to hell for me; but he can seduce me by false doctrine and life, so that I go thither by my own error, into which his error has led me. So nobody can go to heaven for me; but he can assist me, can preach, teach, govern, pray and obtain faith from God, through which I can go to heaven. This centurion was not healed of the palsy of his servant; but yet he brought it about that his servant was restored to health. 32. So here we also say, that children are not baptized in the faith of the sponsors or of the church; but the faith of sponsors and of the church prays and gains faith for them, in which they are baptized and believe for themselves. For this we have strong and firm Scripture proof, Mt 19,13-15; Mk 10, 13-16; Lk 18, 15-16. When some brought little children to the Lord Jesus that he should touch them, and the disciples forbade them, he rebuked the disciples, and embraced the children, and laid his hands upon them and blessed them, and said: "To such belongeth the kingdom of God" etc. These passages nobody will take from us, nor refute with good proof. For here is written: Christ will permit no one to forbid that little children should be brought to him; nay, be bids them to be brought to him, and blesses them and gives to them the kingdom of heaven. Let us give due heed to this Scripture. 21. Now the question is, what becomes of the young children, seeing that they have not yet reason and are not able to believe for themselves, because it is written in Rom 10, 17: "Belief cometh of hearing, and hearing by the word of Christ." Little children neither hear nor understand the Word of God, and therefore they can have no faith of their own. 22. The sophists in the universities, and the sects of the pope have invented the following answer to the question: Little children are baptized without their own faith, and on the faith of the Church, which the sponsors confess at the baptism; thereupon the infant receives in baptism the forgiveness of sins by the power and virtue of the baptism, and faith of its own is infused with grace, so that it becomes a new born child through the water and the Holy Spirit. 23. But if you ask them for the proof of this answer and where this is found in the Scriptures, it is found up the dark chimney, or they will point to their doctor's hat and say: We are the highly learned doctors and we say so; therefore it is true, and you must not inquire any farther. For almost all their doctrine has no other foundation than their own dreams and imaginations... 24. From this falsehood they have gone farther and have even come to the point, where they have taught and still teach, that the sacraments have such power, that even if you have no faith and receive the sacrament (provided you have no intention to sin), you shall still receive the grace and the forgiveness of sins without faith. This they have inferred from the former opinion, that little children receive grace in this way without faith, solely by the virtue and power of the sacrament, as, they dream. Therefore they also ascribe the same thing to adults and to all men, and utter such things from their own mind, and thereby they have in a masterly way eradicated and made void and unnecessary the Christian faith, and have set up human works alone by virtue of the power of the sacraments. Question: Is is possible for an infant to have faith? According to the Luther quotes from the Book of Concord, is Luther affirming that every child that is baptized has the same sort of faith that the pre-born John the Baptist had? what are the differences between the Romanist view and Luther's view of infant baptism? Are the differences substantial or insignificant? a) Baptism is God's activity. Our faith can fluctuate, but God's promise in the sign of baptism always remains. Throughout Luther's writings one can find him exhorting his readers to look back to the seal of baptism and God's promises contained therein. This recollection is a helpful remedy to someone in times of doubt and despair. b) Even if someone's baptism was incorrectly administered, such would not negate God's promises. c) Our lack of faith cannot negate our baptism in the same way Israelites acting incorrectly voided God's covenant with them. d) Most importantly, faith itself is not something that can be ostensively measured like picking up a rock. That is, the Anabaptists did not have the ability to look into another person's heart and know with certainty someone actually had faith. The Anabaptists therefore really couldn't baptize anyone if baptism can only be administered on someone with faith. The Anabaptists could theoretically baptize someone 100 times and not really know with certainty if the person truly had faith. For Luther therefore, the divine word of promise in baptism was intimately connected with human faith (but was not grounded on faith). There was the sign / promise and the faith that grasped the sign. Depending on what Luther was writing, he either emphasized one or other without contradicting either. In writing against Romanists he opposed the notion that baptism was salvific without faith. Writing against the Anabaptists, he emphasized the work of God in baptism- that baptism really does contain God's promises, and even if administered to an unbeliever, it is still a form of the Word of God. Question: If baptism is a form of God's Word, does Luther make any valid points about basing baptism on faith? In other words, does his reasoning here follow based on the premises outlined above (1-4)? Is Luther's reasoning in #d a strong epistemological argument or not? That is, if baptism is only given to those who profess faith, what guarantee is there that the person being baptized truly has faith? When one approaches Luther's Large Catechism, one finds the themes mentioned above. As his exposition begins, Luther treats Baptism with the respect and importance it deserves. a) Baptism is God's commandment. If we claim to be Christians and "regard it as an indifferent matter, then, like putting on a new red coat" such a person will not be saved (Mark 16:16). Luther specifically has the Anabaptists in mind here. Baptism isn't simply common water, but God's Word added to it. To treat baptism flippantly therefore is to deny God's Word. Can a true Christian deny God's Word? No! That's why someone who treats baptism indifferently will not be saved. such a person demonstrates no faith in God's promises. for someone to emphasize faith and minimize baptism is nothing else than placing faith in opposition to the Word of God in the sacrament. Our know-it-alls, the new spirits,﻿﻿ assert that faith alone saves and that works and external things contribute nothing to this end. We answer: It is true, nothing that is in us does it but faith, as we shall hear later on. 29 but these leaders of the blind are unwilling to see that faith must have something to believe — something to which it may cling and upon which it may stand. Thus faith clings to the water and believes it to be Baptism in which there is sheer salvation and life, not through the water, as we have sufficiently stated, but through its incorporation with God’s Word and ordinance and the joining of his name to it. When I believe this, what else is it but believing in God as the one who has implanted his Word in this external ordinance and offered it to us so that we may grasp the treasure it contains? 30 Now, these people are so foolish as to separate faith from the object to which faith is attached and bound on the ground that the object is something external. Yes, it must be external so that it can be perceived and grasped by the senses and thus brought into the heart, just as the entire Gospel is an external, oral proclamation. In short, whatever God effects in us he does through such external ordinances. No matter where he speaks — indeed, no matter for what purpose or by what means he speaks — there faith must look and to it faith must hold. 31 We have here the words, “﻿He who believes and is baptized will be saved.﻿” To what do they refer but to Baptism, that is, the water comprehended in God’s ordinance? Hence it follows that whoever rejects Baptism rejects God’s Word, faith, and Christ, who directs us and binds us to Baptism. 32 In the third place, having learned the great benefit and power of Baptism, let us observe further who receives these gifts and benefits of Baptism. 33 This again is most beautifully and clearly expressed in these same words, “﻿He who believes and is baptized will be saved,﻿” that is, faith alone makes the person worthy to receive the salutary, divine water profitably. Since these blessings are offered and promised in the words which accompany the water, they cannot be received unless we believe them whole-heartedly. 34 Without faith Baptism is of no use, although in itself it is an infinite, divine treasure. So this single expression, “﻿He who believes,﻿” is so potent that it excludes and rejects all works that we may do with the intention of meriting salvation through them. For it is certain that whatever is not faith contributes nothing toward salvation, and receives nothing. 35 However, it is often objected, “﻿If Baptism is itself a work, and you say that works are of no use for salvation, what becomes of faith?﻿” To this you may answer: Yes, it is true that our works are of no use for salvation. Baptism, however, is not our work but God’s (for, as was said, you must distinguish Christ’s Baptism quite clearly from a bath-keeper’s baptism). God’s works, however, are salutary and necessary for salvation, and they do not exclude but rather demand faith,﻿﻿ for without faith they could not be grasped. 36 Just by allowing the water to be poured over you, you do not receive Baptism in such a manner that it does you any good. But it becomes beneficial to you if you accept it as God’s command and ordinance, so that, baptized in the name of God, you may receive in the water the promised salvation. This the hand cannot do, nor the body, but the heart must believe it. 37 Thus you see plainly that Baptism is not a work which we do but is a treasure which God gives us and faith grasps, just as the Lord Christ upon the cross is not a work but a treasure comprehended and offered to us in the Word and received by faith. Therefore they are unfair when they cry out against us as though we preach against faith. Actually, we insist on faith alone as so necessary that without it nothing can be received or enjoyed. Question: Why would Luther argue that baptism is not a human work? Which person or group during Luther's lifetime would say baptism is a human work, and why? 41. What is the Lutheran view ? Their standards state the necessity of the sacraments without apparent qualification (See “﻿Aug. Confession﻿” Art. 9, and “﻿Apol. Aug. Confession,﻿” p. 156, quoted under last chapter). 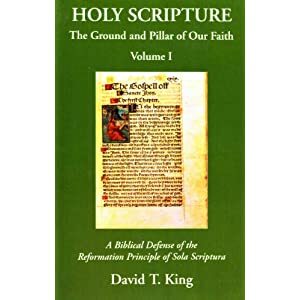 But Dr. Krauth has shown from the writings of Luther and their standard theologians, that their actual view was that (1) baptism is not essential (as e. g., Christ’s atonement is), but that (2) it is necessary, as the ordained ordinary means of conferring grace, yet (3) not unconditionally, because the “﻿necessity” is limited (a) by the possibility of having it, so that not the deprivation of baptism, but the contempt of it condemns a man, and (b) by the fact that all the blessings of baptism are conditioned on faith. (4) Baptism is not always followed by regeneration, and regeneration is not always preceded by baptism, and men may be saved though unbaptized. (5) That within the church all infants are saved although unbaptized. (6) As to infants of heathen, the point undecided, because unrevealed, but hopeful views entertained.––Krauth “﻿Conserv. Reform.,﻿” pp. 557–564. Hodge, A. (1996). Outlines of Theology. Index created by Christian Classics Foundation. (electronic ed. based on the 1972 Banner of Truth Trust reproduction of the 1879 ed.) (628). Simpsonville SC: Christian Classics Foundation. You bring up a name from the past: Gerry Matatics. Probably many people reading this thread would ask, “Who?” Gerry has been out of the limelight for quite a while, but a quarter century ago he and Scott Hahn, then still friends, were bright stars in the constellation of converts. I always respected Gerry’s native talents. As highly as I regard Scott’s talents, I thought that Gerry could have excelled Scott, if he had applied himself. But he never had the self-discipline. As you know, Gerry and I were at odds after he left Catholic Answers. I wrote about him a few times over the succeeding years and for the most part confined my remarks to his religious ideas or actions, but my deeper concerns were at the level of ethics and character. By 2006 Gerry had confirmed himself, publicly, as a sedevacantist (his term, even if in your eyes he qualified as a sedeprivationist), and then he largely disappeared from public view. As he had in previous years, he went on the road, speaking usually at Holiday Inns to tiny audiences—sometimes to as few as six people, from reports I had. And then even the speaking stopped. Maybe he’s doing something like now; maybe Chris Ferrara knows. But it’s clear from Gerry’s website that he no longer has many (or any?) speaking engagements, and, of course, he never has produced a written product. But he still produces recordings and every few months will throw onto the website a pitch for them. The only other outreach he has, so far as I know, is a series of online interviews with Judith Sharp. I suppose those interviews can’t have many listeners. You bring up Gerry’s move toward sedevacantism. This was something I wrote about more than once in “This Rock” magazine, most extensively in the August 1995 issue. Gerry had accepted an appointment as an instructor at the sedevacantist seminary run by Bishop Daniel Dolan in Cincinnati. (I’ve never settled to my own satisfaction whether Dolan was validly consecrated, but we’ll give him the courtesy of the title.) The seminary even had distributed an advertising flyer with Gerry’s name and photo on it. Back in those days Gerry was getting much, maybe most, of his income by speaking in so-called “Novus Ordo” parishes. He had one set of talks—his conversion story, for example—for those venues, another set—lots of anti-Vatican II red meat—for “Traditionalist” conferences. You have heard about Thomas Huxley, known as “Darwin’s Bulldog.” Charles Darwin wasn’t a particularly effective promoter of his own theories, but Huxley sure was. He was out in public far more than Darwin. It was as though Darwin was hidden away, with only Huxley giving the defense. So it was, in a way, with Chris Ferrara and Gerry. Chris was Gerry’s bulldog. I don’t remember Gerry ever writing to counter anything I reported about him, but Chris often wrote against me. As Gerry was making what amounted to a public affirmation of his position, Chris wrote a multi-part series against sedevacantism in “The Remnant,” the first time that he had addressed the topic, so far as I know. He didn’t mention Gerry. At the time I took the series to be a last-ditch effort to pull his friend back from the brink, but the bulldog wasn’t strong enough to stop a leap over the edge. I appreciate that Chris wrote, in post 108 above, that I “was probably right all along about Gerry's sedevacantism. I didn't see it at the time.” I accept that he didn’t see it in 1995 and maybe not even a decade later, but I’m at a loss to explain how it couldn’t be seen. So many others saw it. Maybe this is an example of the loyalty of friendship clouding one’s eyes—or maybe, those many years ago, Chris, because of his animus toward me, thought that the allegations couldn’t be true precisely because it was I who leveled them. It doesn’t matter really. What does matter is that a man with exceptional talents and exceptional promise misused those talents and never fulfilled that promise—not because outside forces were against him but because of his own inner failings. This is the definition of tragedy, as Shakespeare knew it and showed it. Sometimes I think back to the heady days when I first knew Gerry and imagined the good he could do for the Church. It’s hard to conjure up those memories now because they were followed by a sad realization that that good was stillborn. Thanks for the further insights. I chuckled that during your phone call with Gerry he insisted on settling things with you through a public debate. That's been his m.o. Years ago I attended a convention of the Fellowship of Catholic Scholars that was held in Washington, D.C. By that time Gerry was living again in Front Royal. Before I left home I contacted him, saying I'd like the two of us to meet privately and see whether we could begin to forge a new relationship. He agreed to meet me at the convention's hotel. I waited for him in the lobby. He brought with him a large plastic bin filled with file folders. It was like the bins I saw lawyers bring into courtrooms when I used to practice law. Gerry said the folders contained his "documentation" for our debate. "What debate?" I asked. He said he wanted to round up FCS members to sit as a panel to adjudicate the issues between us. I said something to this effect: "Are you nuts? These people aren't here to oversee a trial between you and me. They're here for the convention. I invited you here for a private talk, and you've shown up looking for a public fight. Besides, you didn't let me in on your plan, so of course all of my documentation is at home." As you might imagine, my attempt to effect a rapprochement got nowhere. It was a small comfort to me to learn that something similar happened to Scott Hahn when, on a separate occasion, he was in the D.C. area and made a similar offer to Gerry. Gerry responded with a debate challenge: "The only meeting I'll have with you is a public debate." Sheesh! As for Michael Matt and Chris Ferrara: I know they don't give any truck to sedevacantism (or sedeprivationism). When Chris wrote the series against sedevacantism in "The Remnant," I had the impression that he had to work up his thesis in short order--as I said in my previous post, probably to encourage Gerry to move away from the edge--yet he gave a good account of the anti-sedevacantist argument. You say of Bob Sungenis, "I would add that he played a role in getting the US bishops to disavow that heresy in the adult catechism," your reference being to the bishops changing a text that said Jews don't need to be saved by the Christian covenant because they have salvation through their own. Bob repeatedly has claimed that his writings about the issue caused the bishops to alter the text. This is a post hoc ergo propter hoc argument, and it's unlikely on its face. Bob is perceived by many to have an obsession with Jews, by others to be outright anti-Semitic. How credible is it to think that the bishops would make any sort of change at his behest? Shouldn't those suspicious of the bishops' motives in other things imagine that they would rather have dug in their heels than be perceived as acquiescing to anything pushed by Bob? I haven't seen the least evidence that the bishops were motivated by Bob's writings. After all, the complaint about the text wasn't exclusive to him. Others had been saying the same kind of thing for quite a while. This a clear proof that it is the writting (Scripture alone) 2 Peter 3:1 – "this is the second letter I am writing to you", by which I am stirring up your sincere mind by way of reminder” – in other words, after I am gone (1:12-17), you will have something, somethng solid, a text, a writing, a Scripture, that you can read in order that you can stir up your minds in the truth - And that argument from 2 Peter 1:12-21 and 3:1, points to Sola Scriptura in principle. I asked Jason Stellman, "how do you deal with that in 2 Peter?" and he and others don't seem to grasp the enormity of the supposed first Pope leaving out the teaching that his office would have successors, who would be able to teach the believers after he gets executed by Nero around 67 AD. That is a major teaching to leave out, if it is true, it seems to me. I think it is devasting to the whole Roman Catholic claim that Peter was the first Pope and that God intended the office of Peter in the bishop of the church in Rome to then to be succeeded by another infallible interpreter who would be able to shepherd and guide the church and give the infallible interpetation, and that that office would be passed down all through history.